Last night, an announced crowd of 41,665 showed up to Citizen Bank Park to watch the listless Phillies put up a token effort against Atlanta, a 6-1 loss that put them 14 games out of a wild card spot. 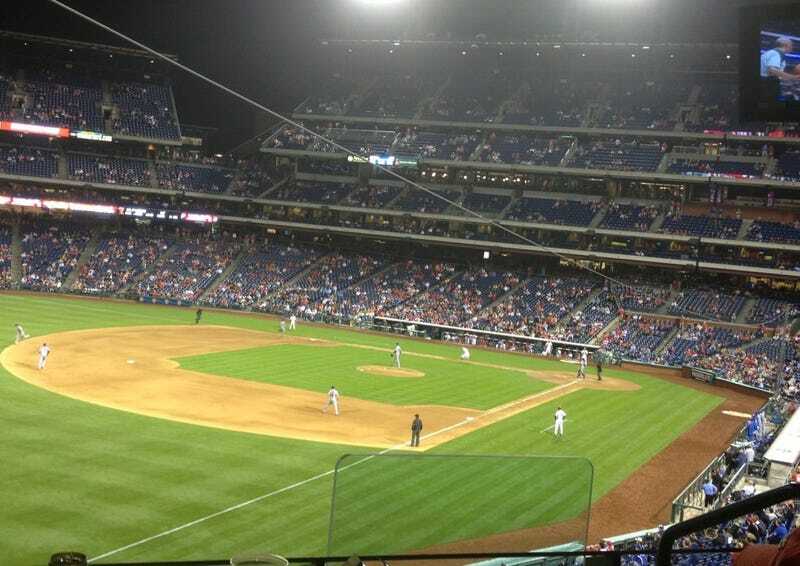 It was the smallest crowd of the year, and the first time since July 2009 the Phillies failed to sell out the ballpark. Look, it happens. You win a World Series, you have a fabulous new ballpark, you become the second-biggest spending team in baseball, you loot the farm system to load up on big-name vets, and you're going to fill the stadium. And the Phillies, who have won the division five straight years, became the biggest ticket in town. But Baltimore and Cleveland will tell you that nothing lasts forever—it's a lost season in South Philadelphia, and all the Schmitters in the world aren't going to keep the turnstiles turning. "Their sellout streak ended tonight, apparently." "They're going to have to take back their own ballpark." Yes, yes, let's all laugh. But celebrating last night as the end of the line merely gives legitimacy to a streak that never was. The Phillies (along with the Red Sox) have been masters of massaging the numbers to technically qualify for an announced sellout, even on nights where hundreds to thousands of tickets remained unsold. How'd they do it? • The Phillies, as part of MLB's partnership with StubHub, are allowed to count tickets purchased by scalpers and resellers, even if those tickets end up in the trash. Upwards of a quarter of tickets are sold on the secondary market. This is the main reason why season tickets are often priced well below market value: they're snapped up by optimistic resellers, who then assume all the risk, while the Phillies take credit for the sale. • The Phillies are allowed to count tickets donated to charity or otherwise given away for free as tickets sold, even if they're never used. (For a baseline, the Red Sox give away nearly 1,000 tickets per game.) This doesn't even count the numerous buy-one-get-one-free ticket offers Philly has run this season. • Citizens Bank Park has room for more than 1,000 standing room tickets, which don't count towards the stadium's official capacity. Even if there are hundreds of unsold seats, they'll still include those standing room fans in the official count. Who decides if a game officially counts as a sellout? The Phillies' own ticket office. So this was one bogus streak that came to an end only because there were so many empty seats last night, it would have been a joke to pretend otherwise. But don't cry for the Phillies. They're still leading baseball in attendance, and last night's gate of 41,665 would still be good for the third-best average in MLB.